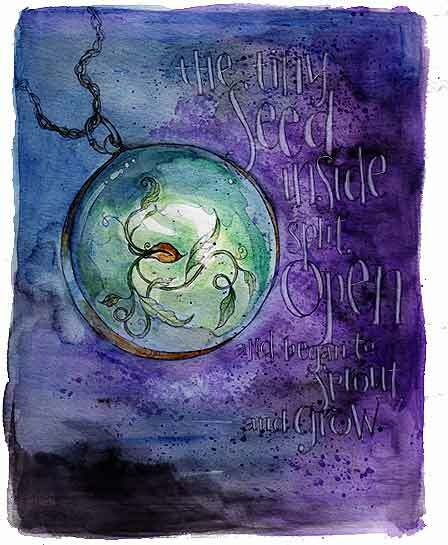 "The tiny seed inside split open and began to sprout and grow." A page from an unfinished story I've been working on. I have a necklace I wear almost every day. It's not impressive looking at all. It's a tiny globe of glass, and inside is a mustard seed. The story of the mustard seed is one of faith; you're not required to have the hugest, most impressive, earth shaking faith. All you need is to begin with something small - faith the size of a mustard seed. And in case you didn't know, from this tiny seed grows a huge, flowering plant. I try to keep that in mind for everything; I don't have to have huge ideas, enormous inspirations, the biggest and best plan. All I need to do is start with a small seed of thought and let it grow and flower from there. "If you have faith no bigger even than a mustard seed ...nothing will prove impossible to you" —Matthew 17:20 and 24.